Atlantic Coast Pipeline proponents assert that Dominion has repeatedly moved the proposed route in a good-faith effort to accommodate environmental and landowner concerns. Yet irrational pipeline opponents are never satisfied. It’s not up to the standard you sometimes achieve. I wondered if I was the pipeline opponent you describe as “worried” that the previously proposed horizontal drilling under Shenandoah Mountain would pollute streams. Actually, I was not simply worried; I was convinced. Take a look at the two attached images. 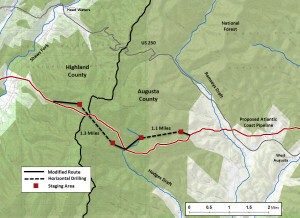 One image is a map, showing the proposed Shenandoah Mountain drilling and Hodges Draft, a small native brook trout stream. 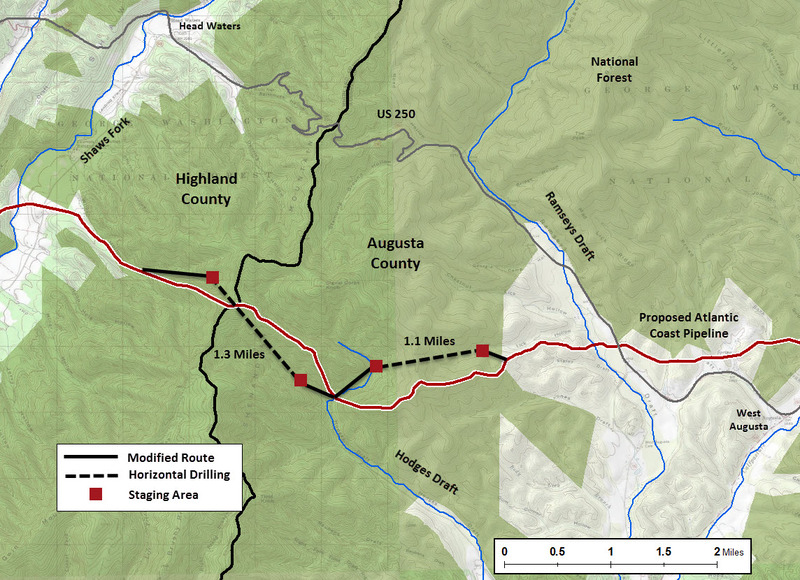 The currently pristine upper reaches of Hodges Draft would have become corridors for access roads, drilling sites, staging areas, and permanently open pipeline right-of-way. It’s not likely that the trout population could have survived the forest clearing, the stream-side and in-stream excavation, and the unavoidable stream warming and sedimentation that the proposed pipeline construction and related infrastructure would entail. Our native trout streams represent some of the best of what remains of the natural world and we should not give them up easily. The other image is an aerial photo obtained in 2015 by the Pipeline Air Force. 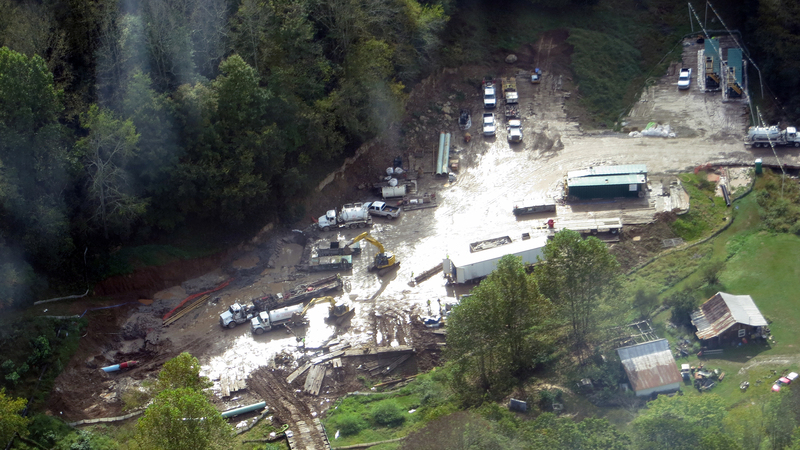 The photo shows a horizontal drilling operation involving a smaller pipeline and a single 1000-foot boring under Interstate 79 in central West Virginia. Dominion’s proposed drilling under Shenandoah Mountain would have been a much bigger deal, with two borings, each more than a mile long. The drilling operation in the photo occurred during construction of the Stonewall Pipeline. GAI Consultants, which prepared erosion and sediment control plans for the project, is also a contractor for the ACP. The construction was done by Precision Pipeline, which claims to have the very highest environmental standards. In contrast to company PR, however, the Stonewall project was serially non-compliant with environmental regulations. 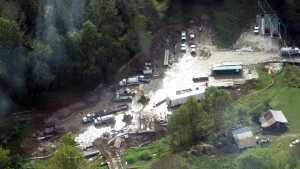 The pipeline developer is now subject to a consent order and a $106,000 fine issued by the WV Department of Environmental Protection. Dominion’s history is not much better. 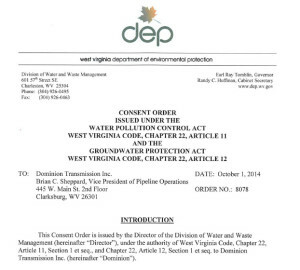 The WVDEP issued a consent order and $55,000 fine for a series of water quality violations at a 2014 Dominion pipeline construction project in northern West Virginia. These after-the-fact fines and enforcement actions are simply part of the prevailing “business model.” Pipelines are built in a hurry with little independent oversight, corners are cut, water resources are damaged, some fines are paid, and it’s time to move on to the next project. Concerning the need for the ACP: A case has been made that the project is mostly about securing a competitive advantage and rate-payer-ensured profit for a powerful and privileged corporation —hardly justification for environmental harm, intrusion into public conservation lands, and state-sanctioned violation of private property rights. Your commentary, however, suggests that you’ve been mislead by company talking points. You need to look beyond Dominion-sponsored analysis. Read the recent report on pipeline overbuilding by the Institute for Energy Economics and Financial Analysis. And read The ACP in a Nutshell, which describes how the ACP will supply facilities that are already well supplied or can be supplied using existing underused gas pipelines. So what is the crux of your complaint? ACP proponents, such as yourself, assert that Dominion has repeatedly moved the proposed route in a good-faith effort to accommodate environmental and landowner concerns. On the contrary, Dominion has instead adopted an abusive and perverse crowd-sourcing approach to planning and advocating for the ACP. This point is well made in the attached Recorder commentary. From the beginning, Dominion considered only some of the most obvious factors in plotting a pipeline route from point A to point B, leaving it up to citizens, landowners, local governments, and environmental agencies to invest the time and energy required for meaningful analysis. 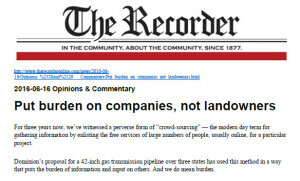 Then, when Dominion hastily modifies the route in response to public concerns — but once again without proper analysis — company spokesmen complain that the pipeline’s irrational opponents are never satisfied. We are not put-off by such posturing. There is too much at stake. And we are definitely not satisfied with Dominion’s persistent lack of real concern about the environmental and societal impacts of its ill-conceived pipeline project. Previously proposed horizontal drilling through Shenandoah Mountain. Additional impact areas associated with access roads, staging areas, and pullback areas are not depicted. Hodges Draft is a native brook trout stream. Dominion has indicated its intention to seek waivers to time-of-year restrictions ordinarily imposed on construction activities that will impact brook trout streams. Staging area for a horizontal drilling operation involving a smaller pipeline and a single 1000-foot boring under Interstate 79 in West Virginia. The drilling distances previously proposed for the 42-inch ACP pipeline in the Shenandoah Mountain area were 1.3 miles and 1.1 miles. Dominion still proposes drilling through the Blue Ridge and under the James River.